Hello all! I am a bit late to the Simon’s April Card Kit Party this month as my kit came very late. Nonetheless I had a blast creating various cards using it, I’ve made 5 already and I’ll share them here over the next couple of days. 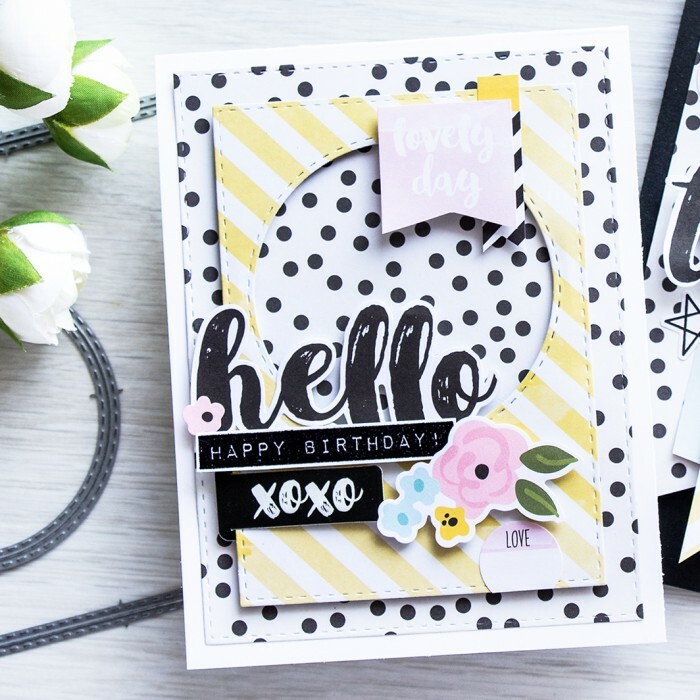 Most of my projects feature Die Cuts & Embellishment Layering – there a lot of lovely bits and pieces in this kit including stickers and plastic clips that work beautifully together. This is the very first card I made when I opened my kit. 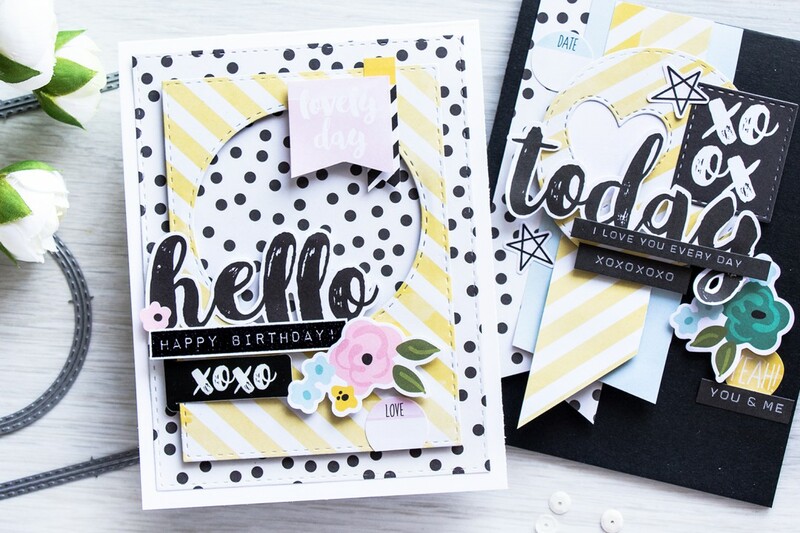 I love the black dot and yellow diagonal stripe papers and die cut those using Simon’s Stitched Rectangle dies, I also added a Stitched Circle die and created a fun frame. 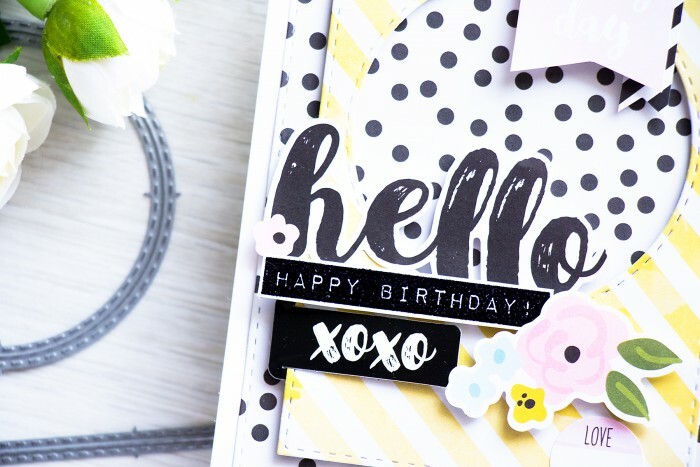 This kit features a lot of beautiful scripty sentiments and I used the “Hello” one, added a heat embossed in Wow’s Black embossing powder “Happy Birthday” and an “XOXO” clip. I also added a floral cluster, this a sticker from the kit, but you can make similar clusters using stamps from the kit. Everything was foam mounted and this resulted in a rather dimensional card, I love projects like this. I also added a few stickers to the top part of my die cut frame. 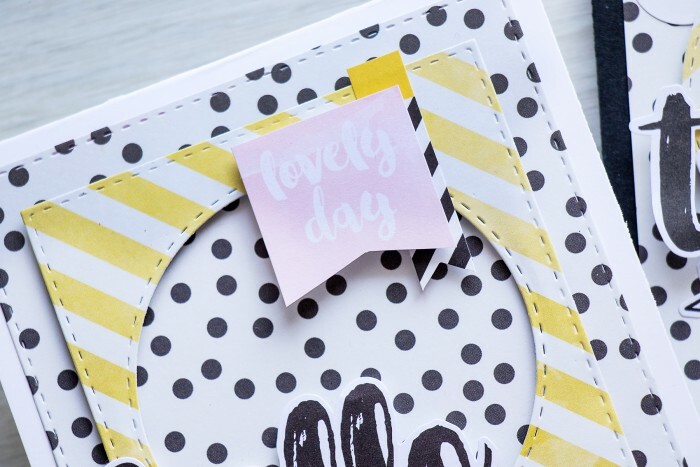 The “Lovely Day” originally was a square sticker which I turned into a banner. Finally my decorated panel was adhered onto a white card base. 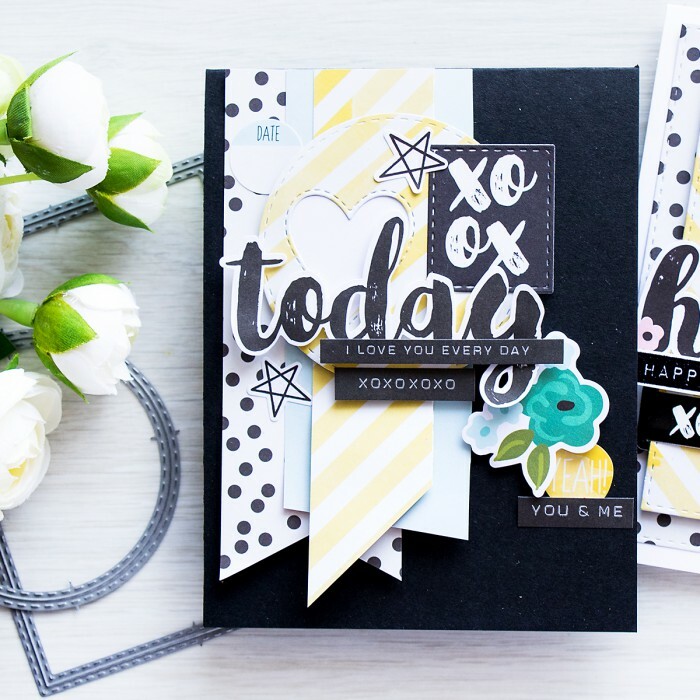 My second card – I Love You Every Day is very contrasting – its done on a black card base and uses some left over papers from the first project. I didn’t want anything to go to waste, so I used remainder of the of pattern papers and cut those into banners and adhered onto my card. 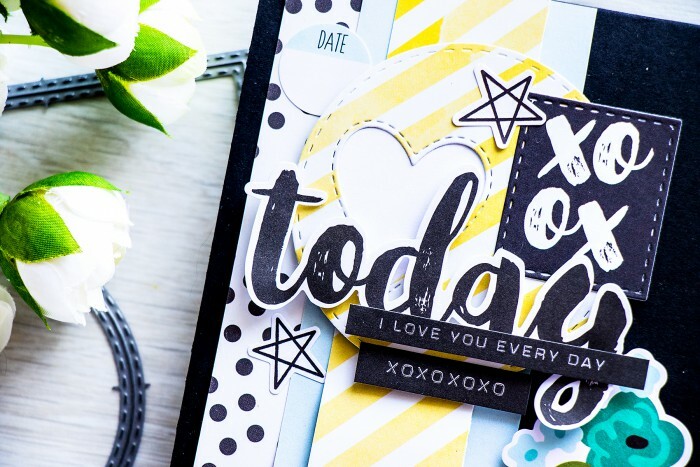 The positive die cut circle that was left over from the first project was turned into yet another frame by die cutting a stitched heart, I layered white cardstock underneath it and foam mounted it onto my pattern paper banners. Just like my first card I added a number of sentiments using stickers and also another floral cluster to make this card a bit more feminine. 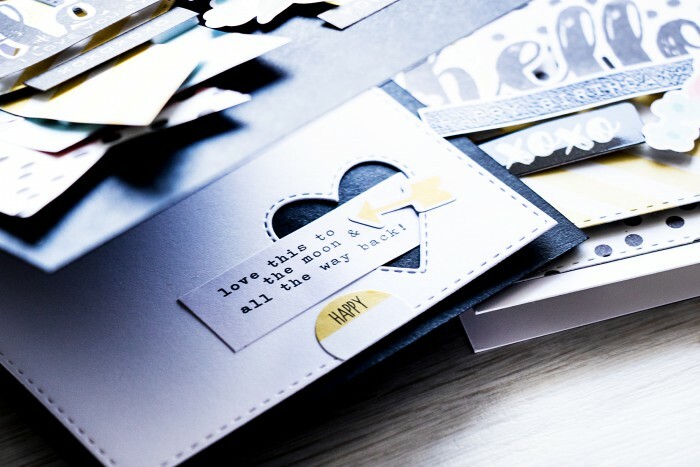 The inside of this project was also decorated using a white die cut panel, another sentiment and a few more stickers. You rock my world with your talent! Whoa! So much PP in this project! Let me your stamped works but loved paper ones long before stamping. 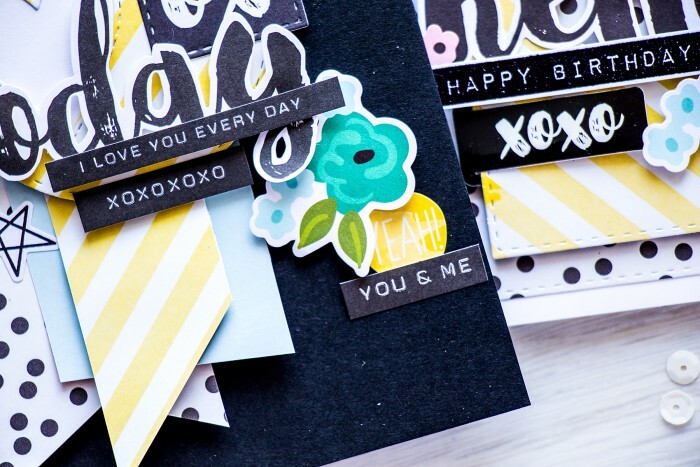 Incredible cards!especially love the black one! hehe 🙂 yes, I used to use pattern paper a LOT in the past, now the only paper I have is from the 6×6 pads I get in my Simon and Gossamer Blue Kits and a bit of paper from First Edition, its a must have for my SB layered cards. These are gorgeous. You’ve made me even more excited to get my kit! so glad to hear that, Leah! thank you so much! I’ve known it! I saw these cards in mail from sss and was for 99% sure they are yours! Love them very much!